Call attention to your business products or services with our Three Two One sticker design template, perfect for almost any retail physical location or online business. 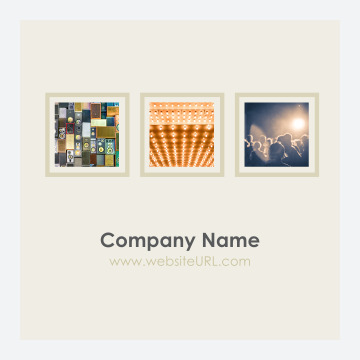 Three Two One features a neutral colored background with space for three graphic images and plenty of room for your company name and website URL or other message below. Available in four different color schemes, two shapes, and three edge finishes, Three Two One lets you focus attention on your unique products or service offerings. Customize Three Two One with our easy-to-use design tool and print custom stickers today! Personalizing professionally-designed sticker templates is easily accomplished with our online design tool. Simply pick your template from our online template library, then let the intuitive tool guide you through choosing your color scheme, shape, and edge finish, and adding your own custom text and images or photos. When you’re done, you can even download a free PDF to share with your customers before printing your custom stickers. You can trust PsPrint’s fast turnaround and reliability—guaranteed. Thousands of the country’s top businesses turn to PsPrint every day for affordable, professional-looking print marketing materials. Our stickers are printed on premium paper stocks with vibrant, soy-based inks to promote your brand in the best way possible. Our custom printing team is on standby with friendly experts ready to assist you with whatever you have in mind for your custom sticker project. Add a metallic, foil stamp or print die-cut stickers in just about any shape imaginable. If you need other print marketing tools, remember we offer a full line, including business cards, postcards, envelopes, and more!